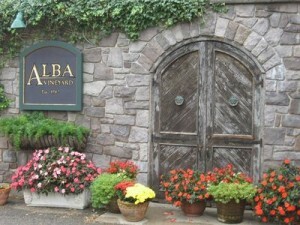 I’d been to Alba Vineyard & Winery years ago, and walked away unimpressed. There was a distinct lack of friendliness in the tasting room, and the wine I liked most at the time was a sparkling wine that Alba didn’t actually produce, just private labeled. Alba is a fairly new winery, founded in 1980, with replanted vines that are mostly about 10 years old, located two miles east of the Delaware River in Milford, NJ. Anyway, fast forward to May of 2016, and things have changed markedly, and for the better! I arranged a tour in advance, and was lucky to have as my guide Nick Sharko, the vineyard foreman and one of the most fun, happy and enthusiastic wine people I’ve ever met. As we left the winery for the vineyard, Nick walked backward, facing me so he could talk, and evidently he knows the terrain of his grape farm so well he never needed to look behind him. As I walked into the vineyard, Nick described in great detail how Alba—he, really, and his crew—manage the vineyard, how they train and trellis the vines, how and when they green harvest for concentration, position the shoots on which the berries grow, and prune and control the leaf canopy to avoid mildew and rot. What you really get out of all this is that winemaking is really just agriculture – it’s farming, and it’s more painstaking and detailed work than you can imagine. The view up the slopes of the vineyard is impressive, and there are more blocs hidden from direct view. Nick pointed out blocs where Alba grows different grapes, and in the finest traditions of New Jersey wineries, there are many varieties (maybe too many) and several clones of each on these slopes that sit in the Musconetcong River Valley. These include Cabernet Franc, Pinot Noir, Riesling, Gewurztraminer, Chardonnay, Vidal Blanc, Barbera, Chambourcin, and Cayuga. He also pointed out in the distance below us the new winery and tasting rooms under construction that I’m looking forward to seeing in the fall, replacing the current, historic structure that’s more than 200 years old and has been painstakingly preserved. One very interesting thing that Alba does is source fruit from Washington State’s Columbia Valley, bring it all the way to New Jersey in refrigerated trucks, and then crush, ferment, rack, age and bottle it right here in the Garden State. These are labeled “Chelsea Cellars” wines, and they include Merlot, Syrah and Cabernet Sauvignon. Now there’s some controversy about this practice in winemaking (and wine drinking) circles, but in my view, anything a winemaker can do within reason to make good wines from fruit sourced anywhere is a good thing. I tasted a range of Alba wines and found all of them interesting with no flaws, and some were tremendous. On a hot day I would especially recommend the 2015 Chelsea Dry Rose, and I thoroughly enjoyed the 2014 Estate Reserve Chardonay and 2014 Gewurztraminer. Other notables include the 2013 Chambourcin, made from a North American grape, and the port-style wine labeled 2100 Vintage Port. This is a tremendously fun place to visit–and picnic–with great wines and idyllic scenery. I recommend it highly! What’s in a Wine Word?